The Most Complete Weight Loss Program Available! Diet and exercise are critical to a good weight loss program, but 99% of weight loss programs leave out the most important and powerful key of all – your Metabolism! Your metabolism is the ‘switch’ that allows real weight loss to happen. In most people this switch is off! Metabolism correction is the defining factor between a superb weight loss program and a very limited weight loss program. Your metabolism controls the benefits of any dieting and exercise, but it, in turn depends on your diet and exercise to operate properly. In other words, the 3 keys interconnect, so a weight loss program will NOT work without all 3 keys!The System 10 weight loss program includes all 3 keys. However it doesn’t stop there. What is missing from all weight loss programs is PRECISION! The 3 keys need to be put together with precision. No other weight loss program Worldwide has the precision of the System 10 weight loss program. You need precision in the food plan calories, in the exercise plans and in the metabolism correction tailored to individuals based on their weight, fat level, routine daily activities and fitness. This is the factor that super-charges the System 10 weight loss program and makes it miles better then all other weight loss programs. The one plan suits all mentality of weight loss programs is completely wrong. The tailored precision is what makes this weight loss program easier and more enjoyable. The precision helps prevent you from ‘sticking’ after 3 weeks and getting no more results. The precision helps you keep the weight off afterwards. Most important of all this precision is vital to shifting stubborn fat especially from your stomach, hips and thighs. The System 10 weight loss plan is specifically designed to target stubborn body fat especially on your stomach, hips and thighs. This weight loss plan is also the only way to re-balance ‘top’ or ‘bottom’ heavy bodies. This can only be achieved if your weight loss plan has the 3 keys and our precision. The reason System 10 works is that not only will you be burning real fat (not just water like on most plans!) but you also burn lots more fat! On top of that the metabolism key in particular opens the doors to access stubborn fat areas which are normally closed due to metabolism faults. Probably for the first time ever you will be doing a weight loss plan that actually accesses your stubborn fat areas and so giving you the results you want! 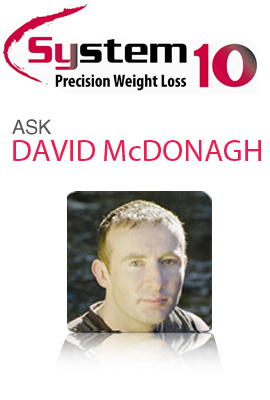 It is for these same reasons the System 10 weight loss plan helps you to re-balance ‘top’ or ‘bottom’ heavy bodies. So if you are an ‘apple’ shape (top heavy) or ‘pear’ shape (bottom heavy) this weight loss plan will help you achieve real results real quick! Real genuine weight loss programs must have the 3 keys and here is why. A good metabolism gets you burning fat 24 hours a day, 7 days a week! To get maximum results from weight loss programs you need to get your metabolism working right. Metabolism faults like undiagnosed slow thyroid (30% of adults), high blood sugar levels (50% of adults), constipation (40% adults) and hormone imbalance (40% adults), will limit or stop a weight loss programs success no matter how much dieting or exercise you do. Diet change is obviously very important for weight loss programs. However under-eating is worse than over-eating. Most weight loss programs have you under-eating. Under-eating kills your metabolism within 4 days! Under-eating saps your energy and leaves you hungry and feeling deprived. Far more important than calories is the balance between the fats, carbohydrates and proteins in your diet. This means you can normally eat more and lose more! You will also have more energy which is vital for your motivation. Exercise (Cardio & Toning) is critical to a weight loss programs success. First of all it is the fastest way to wake up a sleepy metabolism. The extra calories burned also mean you lose weight faster. Toning in particular rapidly improves your metabolism and also adds firmness and extra inch loss that you just cannot get even with a brilliant diet. Lose weight without exercise (especially toning) and you end up a saggy weight loss mess! 1) A report letter rating your metabolism from 0 to 10. 2) Identification of your main metabolism problem areas to fix. 3) Precision 7 day food plans to help fix your metabolism and maximise your weight loss. 4) Our food plans are normal natural easy prepare everyday foods. 5) A step by step exercise plan that will speed up your weight loss and deliver fast toning. 7) Our full colour Weight Loss Success Guide with our unique weight loss secrets, with instructions on how to operate your plan and with the best skills for getting and staying motivated! 8) Weekly weigh-ins and motivation if you purchase through our agents nationwide. No other weight loss plan does more than System 10 to make you succeed. Unlike other weight loss plans, we can stand over and justify everything we do. If you want the best, the fastest and the safest weight loss plan, then get the System 10 weight loss plan today! Because of the science in the System 10 weight loss plan, including the 3 keys diet, exercise and metabolism correction with individualised precision, our weight loss plans are especially powerful and effective for people with specific conditions. Our weight loss plan is especially beneficial to those with sluggish thyroid or hypothyroidism, those with diabetes especially type 2 diabetes, those with high cholesterol, high blood pressure, fibromyalgia, chronic fatigue, constipation, ladies with endometriosis, PCOS or fertility problems and the severely overweight or obese. Indeed most other weight loss plans will deliver very little results for these conditions and often make them worse due to their unbalanced nature. The metabolism correction in our weight loss plan in particular can make all the difference for these conditions as we are getting to the root cause and helping to correct the problem from the ground up. Severely overweight and obese people in particular tend to have multiple metabolism problems and unless you go and fix them they will never succeed.